✓ An onsite stretching guide chart is a staple in the workplace. Employees should be encouraged by their employers to participate in a quick 10-minute stretching program, which can be conducted at least once a day to avoid stiff muscles and joints which will help increase the employee's range of motion. In particular, workers employed in jobs which demand heavy lifting, or standing and sitting for long periods of time should spend 10 minutes a day stretching. ✓ This poster helps stretch the entire body with 12 of the most effective stretching exercises you can do! Stretching reduces stress, decreases the risk of injuries, improves your range of motion and posture, reduces soreness, improves energy levels, increases stamina and promotes healthy blood circulation. Our products come with our 30-Day money back guarantee. 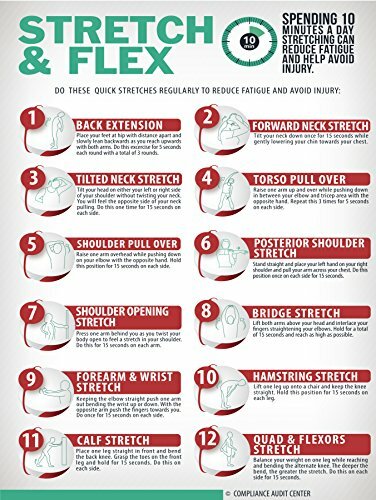 ✓ If your employees are sitting or standing for long periods of time, this Compliance Audit Center Stretch and Flex 10 minute stretching poster is the perfect guide to hang on the wall of your most commuted workplace areas. It contains easy to follow stretching exercises that anyone can do to relax their upper and lower body and release any accumulated muscle tension. This body stretching guide is easy to understand and includes graphics that display exactly how to execute each stretch. ✓ This anatomical stretch and flex onsite workplace chart measures 18" x 24" - Our waterproof UV coated 10-minute stretching guide poster is printed in full CMYK color for optimal resolution. Clear, legible, and full-color print! Let your employees know the importance of stretching their muscles and motivate them to do so to avoid common work-related injuries. Our easy to follow visual chart is ideal for those unfamiliar with how to best stretch before exercise. ✓ Businesses such as retail stores, warehouses, schools, restaurants, medical offices, professional offices, Fortune 500 companies, and much more currently post our 10 Minute Stretch and Flex Poster, to help their employees gain range of motion after standing or sitting for long periods of time. All of our posters are carefully designed to prevent lamination from lifting. Upon receipt, lay the poster out flat with weights on each edge overnight, and it will easily hang the next morning. If you have any questions about this product by Compliance Audit Center, contact us by completing and submitting the form below. If you are looking for a specif part number, please include it with your message.